It’s still snowing to beat the band back east – those poor people. But here in Northern California, we had a bit of wintry weather over the weekend, especially the farther north you traveled. For the first time in its ten-year history, I was able to attend the Alsace Festival in Anderson Valley, and I’m planning never to miss it again. There are at least ten good reasons why. 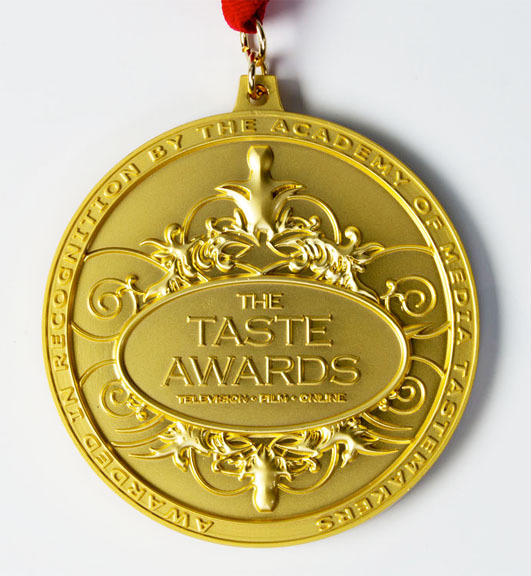 I’ll get to those memorably delicious points in a minute, but first, a quick primer on what is meant by “Alsatian varieties.” For this festival, the menu is all about Pinot Blanc, Pinot Gris, Gewürztraminer, Riesling and Muscat. The one thing they all have in common? Their incomparable aromatics. Thankfully, many wineries bottle these in screw-caps – yay! – to preserve their princess like precociousness. 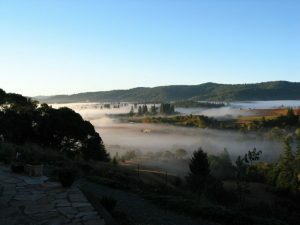 In Anderson Valley, these grapes are prevalent, and a significant number of wineries produce at least one of them. Some, like Handley Cellars and Navarro, produce all or nearly all of them. 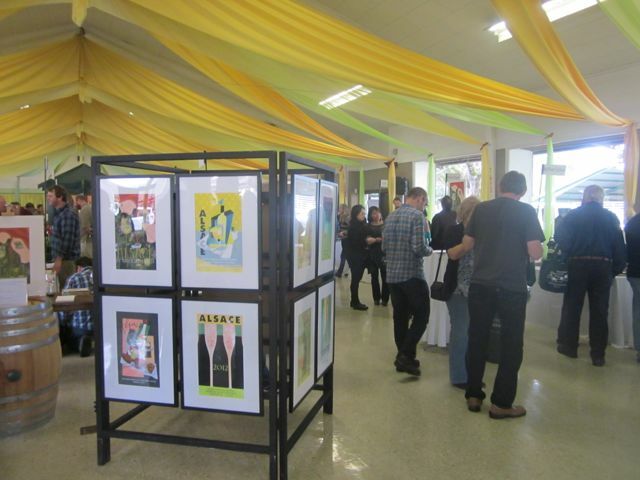 This event, typically held the first weekend of February, features a Grand tasting event on Saturday, complete with morning seminars, held at the Boonville Fairgrounds. 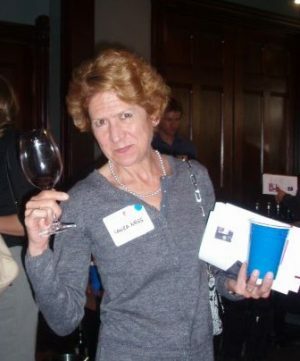 Several winemakers host wine dinners the night before. Then, on Sunday, most of the wineries who make Alsatian varieties are open, featuring all manner of food pairings with these sensational wines. 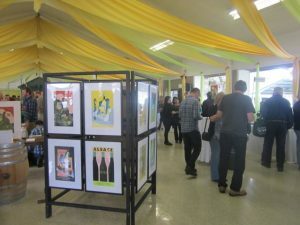 In addition to the 16 wineries from Anderson Valley pouring, the Grand Tasting featured 14 wineries from other regions in California, including Napa, Mendocino and Edna Valley, along with tables of wines from New Zealand, Alsace and New York. There were even two wineries from Oregon. You won’t lack for food at this event, either. We were treated to all manner of cheeses and jams, goodies from Cory Morse Catering and Boont Berry Farm, oysters from Tomales Bay, exquisitely prepared steelhead with caramelized onion butter and sea salt by Chef Francois de Melogue and outrageous Millionaire’s bacon from Little River Inn’s Executive Chef Marc Dym. 2013 Greenwood Ridge Estate White Riesling, Mendocino Ridge: Beautifully crafted from 40 year-old estate grapes grown on Greenwood Ridge, this wine lures you in with its graceful swanlike acidity, just the right amount of petrol on the nose, spunky and juicy green apple on the mid-palate and crisp grapefruit on the finish. For $20, it’s hard to beat, and this stuff ages beautifully. They were pouring 2002 and 2006 vintages at the winery on Sunday, and we were beyond charmed. 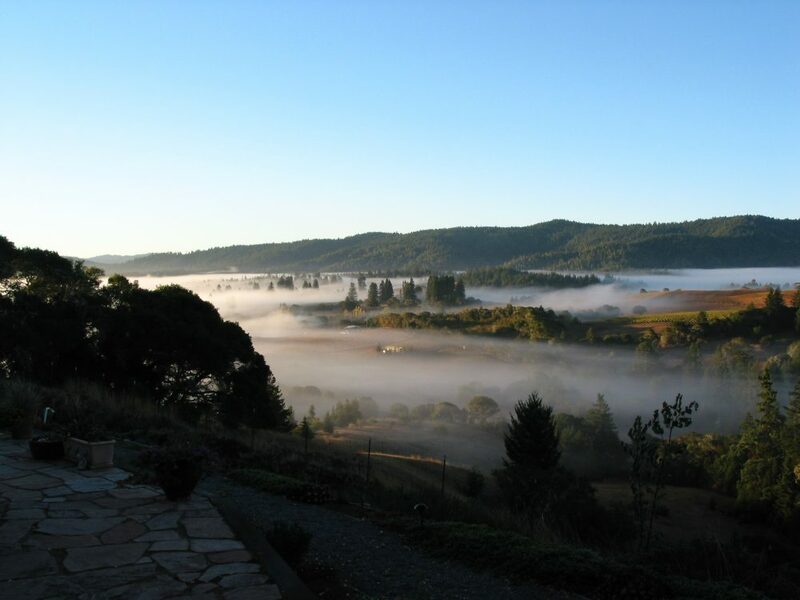 The Mendocino Ridge AVA overlooks the Anderson Valley and receives significant ocean influence. 2011 Fox Run Reserve Riesling, Seneca Lake, Finger Lakes, NY: Pretty much the epitome of the petrol-in-the-nose character that makes this variety a head turner of the highest order. My friend Barb Drady calls this property of Riesling, “classic Mercedes tailpipe.” This isn’t dieselly, instead, it’s more like jet fuel, and the flavors are as pronounced and distinctive as the acid that makes this one relentless wine, in a very good and memorable way. 2013 Handley Cellars Pinot Blanc, Mendocino County: Winemakers Milla Handley and Randy Schock nailed this grape perfectly, preserving the delicacy of its aromatics, the purity of its white peach and nectarine flavors, and the soft roundness of its texture. You could almost call this wine plump, with its plushy middle that reminds one of peaches and clotted cream. Their dynamite 2013 Pinot Gris, is just about perfection, too. 2013 REIN Pinot Blanc, Schrader Ranch, Mendocino: Owner/Winemaker James Wasson IV has a deep respect for the German style of making wine (the winery’s name, pronounced rain, means pure or purely, in German). He really pulls off a beauty with this alpine flower-filled fraulein, as fresh as the daffodil-covered hills of spring. From a vineyard south of Ukiah, this unfined, unfiltered, native yeast fermented wine is bone dry, pure, persuasively filled with nectarine and nicely spiced with fennel on the nose and finish. 2013 Toulouse Pinot Gris, Anderson Valley: This relative newcomer on the Anderson Valley scene, features a rhyming goose on the label, so you’ll never confuse it with anything else. 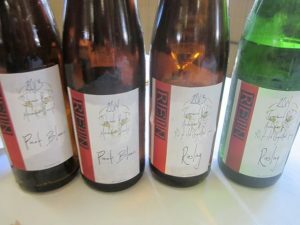 What’s inside the bottles is pretty special, too, and everything I tasted here was lovely, including a tank sample of 2014 Riesling, a tortuous tease. The PG is delightful, delicate and poised, yet flowing with flavor. A crowd pleaser. 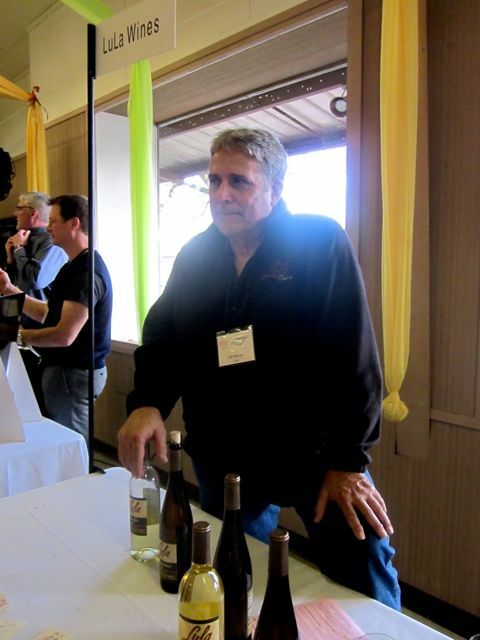 2013 Navarro Estate Gewürztraminer, Anderson Valley: Winemaker Jim Klein is doubtless the King of Alsace in Anderson Valley, and the first whiff of this perfumey spicy zesty wine will literally tickle your nostrils. One sip of this sassy, mouthwatering, totally dry (ok, .25% RS) Alsatian hussy will inevitably lead to another. It’s hopeless not to love. 2011 Lawson’s Dry Hills Gewürztraminer, Marlborough, New Zealand: Sensationally everything you want in an off-dry Gewürz, from that pop of exotic orange cinnamon spice and flutter of rose petals to the unmistakable richness of lychee, white fig and splash of cardamom. Fine stuff. 2013 Cartograph Riesling, Greenwood Ridge: From the same property as wine #1 on this list, this version is higher in alcohol and lower in RS, punches up the aromatics with a bit of apricot and orange peel and comes across taut and lean. Really fun to drink, it possesses a virtual sneaker wave of acid that hits you on the finish. 2013 Lula Cellars Gewürztraminer, Mendocino: Done in the dry style by winemaker Jeff Hansen, this manages to be both austere and fleshy, with beguiling flower market aromatics and tangerine dream flavors that glisten like metallic paint in the sun, lingering long and fervently on the graceful finish. 2013 Signal Ridge Estate Pinot Gris, Mendocino Ridge: All about spring flowers, the honeysuckle and Scotch broom aromas will delight. Flavorwise, this Pinot Gris is a negotiation betwee sweet ripe white peach and zesty, tangy grapefruit: the acidity and minerality help steer it to a clean, lipsmacking conclusion.